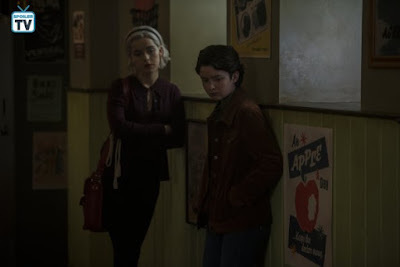 After a stellar 10 episode run and chilling X-mas episode, Chilling Adventures of Sabrina returns this Friday with a brand new 9 episodes. 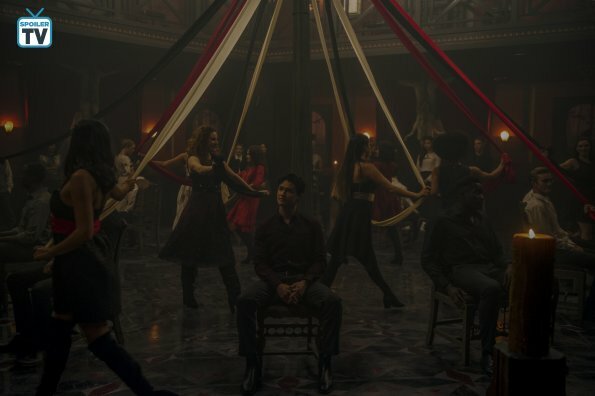 As a sort of privileged member of the "press", I had the pleasure to watch the first 5 episodes of the second part and share some of my thoughts of you. The second chapter of Sabrina`s story is different than what we saw of the show so far. 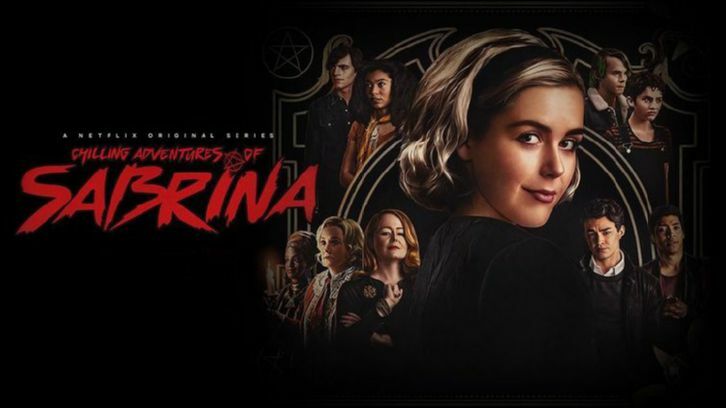 As the show struggles with some pacing issues it still succeeds in deepening Sabrina`s story and the world she lives in, as the game between "good" and "evil" were on colliding course. As Sabrina accepts her witchy side to its fullest an enemy emerges in the form of Father Blackwood whose anti-feminist agenda gets bigger dimensions. This aspect of the story felt ungrounded. The built up towards this story of a woman dismantling and hating Father Blackwood was a bit unfounded. Still, Richard Coyle is deviously hatable in this role and his clashes with Kiernan`s Sabrina are pure gold. 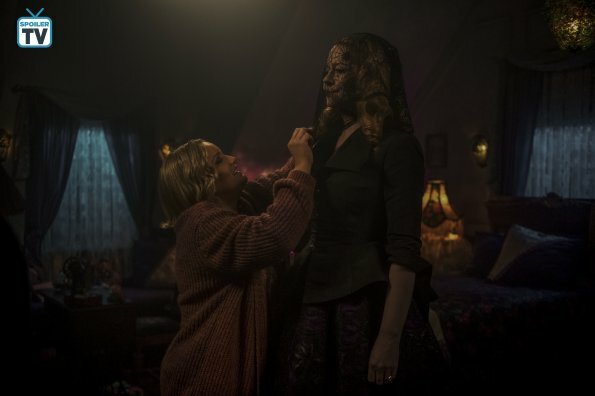 Sabrina gives him a run for his money and seeing Blackwood sweat is one of the greater pleasures the show provides. Besides her witchy life, the love life of Sabrina Spellman gets tossed around quite a bit. While her relationship with Harvey is done done at the same time it really isn`t done and it may never really be. The scenes Kiernan and Ross share carry great pain and beauty. The writers don`t really allow for Sabrina`s heart to get cold as the nicely tanned abs of Nick Strange are there for her. 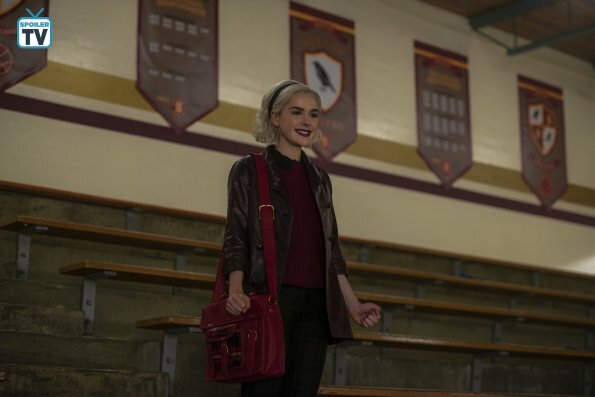 Initially, I wasn`t a fan of Sabrina moving on so far and so hot, yet her interactions with Gavin Leatherwood`s Nick are solid. The two of the work well on screen and the way the writers approached them let the transition flow well. A story I am never really fond of is taming a bad boy so swiftly. I one girl changes all. While that does occasionally happen in some cases. The writer cut Nick`s bad boy head to swiftly. Nevertheless, Nick is a strong character and the writers use his strong screen time well, showing some soul under the tan lines. In the Muggle world, Harvey is served a love interest as well. And while most of the fandom (including me) will majorly eye-roll at this development. Otherwise, a new-ish character is named during this first couple of episodes. And while the ridiculousness of this story is borderline to a degree, it gives a community voice and representation which is good. The new headmaster of Baxter High is also revealed. And its no other than Mrs. Satan. Michelle Gomes is still the most devious and exciting devil this show has seen. The game between her, Sabrina and the Dark Lord are pushing things into an interesting direction as the spot for Lucifer`s favorite general is on, even though Sabrina has no clue it`s on. The Dark Lord gets a more physical appearance during this part of the story and introduces an unexpected temptation for Sabrina. Last but certainly not least, there are Zelda and Hilda. Both Spellmann sisters face new romantic advances as the relationships with their season 1 baes advance to new levels. Yet that doesn`t prevent them to deliver hilarious moment and some dramatic tension. The writing for both Zelda and Hilda was flawless. It exploited the actresses abilities properly and gave their characters space to evolve as individuals, sisters and to a degree as Aunts. The Aunt angle was a bit lot in these 5 episodes. Hilda still had the occasional moment while the angle was mostly dropped for Zelda. - Ambrose story gets an unexpected twist towards the end of episode 5. As they say, what doesn`t kill you makes you stronger. - The Weird Sisters are weird as usual. Tati Gabriel gets a bit more spotlight as usual and her scenes with Kiernan are good. She brings out the dark luscious side of Sabrina and I love that. - Episode 4, "Doctor Cerebrus`s House of Horror" is one mighty filler-ish episode. Power through it guys. I believe in you. - A lot of Familiars stuff, mostly gross. Are you excited for the return of Sabrina and her Witchy and none Witchy friends? Sound of in the comment section down below.